A Sight for Sore Eyes - Safety Showers - ThermOmegaTech, Inc. Imagine the following scenario: One of your plant floor employees has just had their eye or skin exposed to a caustic chemical, which needs to be immediately flushed from contact. Per OSHA regulations, you should already have an eye washing station or emergency shower on the plant floor, which the employee should be familiar with. In an instant, they need the proper water, at precisely the correct temperature, to prevent scalding or escalating the issue any further. Can you be sure that your employees are safe in a washing emergency? In order to fully comply with these safety standards, Driscoll directs manufacturers toward two established standards. The first is OSHA’s 29 CFR 1910.151(c), which states, “Where the eyes or body of any person may be exposed to injurious corrosive materials, suitable facilities for quick drenching or flushing of the eyes and body shall be provided within the work area for immediate emergency use.” The ANSI standard Z358.1 is the recognized source of guidance to comply with OSHA 1910.151(c), and will allow manufacturers to not only escape OSHA citation, but also keep their employees safe. The ANSI standard, according to Driscoll, “requires tepid fluid flushing, and they define that their minimum temperature for tepid water is 60 degrees F. We found out that the range is 60 to 100 degrees F,” Driscoll says. This “lukewarm” range allows for comfortable, safe washing during the entire cleaning process. With most water entering the plant at around 50 degrees F, there is an obvious need to treat it properly before use in an emergency, and according to Driscoll, this situation is heightened in the winter. The water temperature can be a difficult — and dangerous — issue if not addressed properly, before an emergency situation occurs. Driscoll says, “If the water is over 105 degrees F, there could be a scalding risk to that employee, so they would need to have some type of scald protection device [in the system] to maintain a water temperature under 105 degrees F.” To address this concern for tepid water, Therm Omega Tech has put a great deal of research into a system that delivers a reliable, 85 degree F stream of water. The process is relatively simple. Driscoll explains, “There is the steam inlet line, and the water inlet line. Our main valve is always in the ‘shut mode,’ and when a safety shower is triggered — when they need that tepid water — that valve opens up and allows steam into the heat exchanger. Water is always flushing through the system, but the steam and the water never mix.” The system uses a braze-plate heat exchanger to transfer the heat from the steam to the 50 degree F water, which heats it to the proper tepid range. Numerous valves and sensors detect and modulate the water’s temperature as it moves through the system’s piping. The “final inspection,” according to Driscoll, comes with a final valve that adds redundancy to the complicated process, and allows the system to reliably output that 85 degree F medium. But temperature is not the only ANSI standard that manufacturers should be concerned about. The shower units need to be able to output at least 20 gpm for a sustained 15 minutes, at a minimum, in order to ensure that the caustic material has been removed from the employee’s body. The shower must also reside on the same level as the hazardous area, within 10 seconds of the employees. In addition, it should be in a clearly-marked, accessible location with a path that is free of obstructions that employees might collide with, if unable to see properly. Any type of system — whether piped or self-contained — must be maintained on-schedule to ensure proper function. The good news is that if a manufacturer knows that it has fallen behind on compliance with OSHA and ANSI standards in regards to tepid water reliability — or any of the aforementioned requirements — solutions are not difficult to come by. 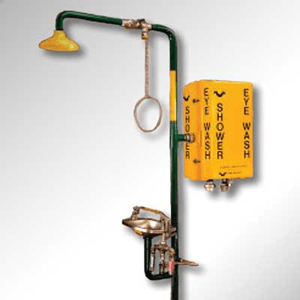 When looking to purchase a new eye washing or emergency showering system, it’s important to look for certification with the OSHA 29 CFR 1910.151(c) and ANSI Z358.1 standards. This will ensure that the water emerges within the tepid range, allowing for employee comfort, and preventing further injury. Ask the vendor to provide the certification, and if none is available, be sure that you can meet the OSHA and ANSI standards in different ways. The emergency scenario is unlikely, and something we hope to never see on the plant floor. But they do happen, and it’s better to be prepared beforehand. Ten seconds is not enough to protect your employees from a system that is not compliant. Not only will that cost you a possible citation from OSHA, but the well-being of your most important asset: your people.